This post is for the wonderful Erica Bohrer from Erica Bohrer’s First Grade! I just love her blog, she has many amazing resources! 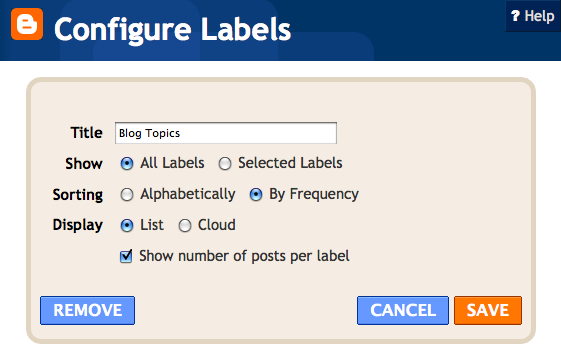 This is one of my most favorite parts about Blogger–labels! I love how you can organize all of your posts…and Blogger makes it really easy to maintain once you’ve started. There are a bunch of nice options too. 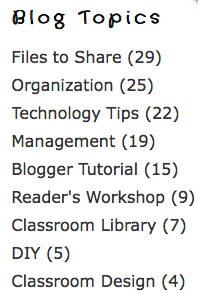 To organize your blog by labels, go to the Gadgets tool in your sidebar. Select “Add A Gadget”. From the gadgets list, choose “Labels”. Now you will see some different choices for displaying your labels…I like to sort mine by frequency so readers can see what is posted the most first. I also like the list format. I try to keep my label list pretty short (but it’s really hard to do!) so I can keep it displayed as a list, but not too long of a list! There are a couple of ways to label your posts. The easiest of choices is to use the box at the bottom of your posting screen and just type in a label name. It will be loaded automatically into your Labels widget…as long as you selected “All labels” in the Configuration screen. Once you have your basic label names, Blogger makes it easy to maintain them. All you have to do is enter the first character or so of your label name and the full name will automatically pop up! Then, you can just click on the name and you’re good to go. The default name for the Labels widget is (surprise!) Labels, but you can change the name if you’d like. I like to use Blog Topics, as you can see! One other neat thing…if you create page tabs at the top of your blog, you can get the link for all of your labels in one category (like I used “Organization” for my Organization button at the top). This will show all posts in that category when the button is clicked. What kind of label configuration do you like best, the list or the cloud? OMG you work fast! Thanks so much for posting. I have learned so much from you already! You are so techi it's inspirational. I don't know what kind of label configureation I like but I hope to find out soon. How exactly Do you create tabs at the top?? I can't seem to figure it out! Stephanie, the tabs are part of the blog template I made (they're built into it). But you can make buttons…I have a couple of tutorials on buttons on here. Thanks. I am just working to try to make my blog more interesting and also functional, and this is all pretty new to me! Just used this handy blogger tip to organize my posts. Thank you!